Protecting those who have protected us. I always wanted to be a pilot for as long as I remember from my earliest days. Before I could drive, I pedaled my bicycle down Bellaire Boulevard in Houston, Texas, down to Highway 6 so I could watch the airplanes at Sugar Land airport. A good 15 mile pedal one way! As soon as I could take the private pilot examination and start flight lessons I began. After my initial flight training in a Cessna 172, I enrolled at Texas A&M to pursue a degree in aerospace engineering. At Texas A&M University I worked at the flight dynamics laboratory and the 7x10 foot low-speed wind tunnel. After graduating from Texas A&M with both a Bachelors and Masters of Science in Aerospace Engineering, I was off to OTS at Lackland AFB, TX (Medina Annex) to begin my military career. The first challenge at OTS was completing the OTS Flight Screening Program at Hondo, TX where we flew the T-41. Graduation from this program as a FISHPOT (Flight Screening Program Officer Trainee) led to OTS and commissioning as a Second Lieutenant. The next stop was the sunny Arizona desert where I earned my wings flying T-37s & T-38s. I was now a USAF Pilot. I selected the B-52 as the B-1 was slated to be assigned to Texas, and not wanting to be a T-37 Instructor Pilot because I did not like early week / late week. 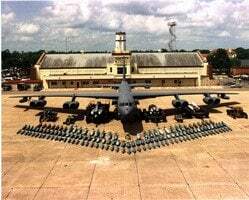 I was the only volunteer for the B-52 that MPC had that cycle. The T-37 community, however, was not going to give up without a fight, after having to speak to the Squadron and Wing leadership and proving I was not crazy, I was assigned to Anderson AFB, Guam. During B-52 initial qualifications, I learned the "real Air Force" had early week / late week all the time! My initial assignment to Guam was truly rewarding, and during my career I have traveled to most parts of the world. Guam, Japan, Australia, the Pacific, Korea, the Middle East (Kingdom of Saudi Arabia, Bahrain, Kuwait), and all over the United States were places traveled or assigned. Duty Assignments have been at Lackland AFB, Medina Annex, TX, Williams AFB, AZ, Castle AFB, CA, Anderson AFB, GU, K.I. Sawyer AFB, MI, Castle AFB, CA, Maxwell AFB, AL. Assignments have been B-52 copilot, pilot and Instructor Pilot, and ACSC Academic Officer and Operations Officer, then HQ USAF Staff Officer at the HQ AF Doctrine Center. A Command Pilot with over 3,000 hours in the T-41, T-37, T-38, B-52, KC-135, and RC-135. Combat veteran of OPERATION DESERT STORM, DESERT THUNDER & DESERT FOX. The people I have served with are what made the assignments memorable. From my air crew members, the buddies in DESERT STORM to being the Operations Officer to 80 talented International Officers truly made my career special. 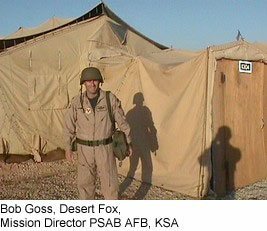 In DESERT FOX, I was the Mission Director overseeing all the sorties from Prince Sultan AB, KSA. That was very rewarding. I retired from active duty after almost 21 years of service and being seriously injured. My other employment history in the United States Air Force covering almost 21 years includes senior instructor aircraft commander, combat planner, combat mission director, and chief of numerous divisions and flights at the squadron, Group, Wing, and Headquarters United States Air Force level. A lifetime member of the Order of Daedalians, and the VFW. Mr. Goss is a member of several professional associations, including the American Bar Association, Federal Bar Association, American Intellectual Property Law Association, Houston Intellectual Property Law Association, and American Health Law Lawyers Association. Mr. Goss also holds numerous military decorations and professional licenses. Maxwell AFB Angel Pin Award Winner [national volunteer award].